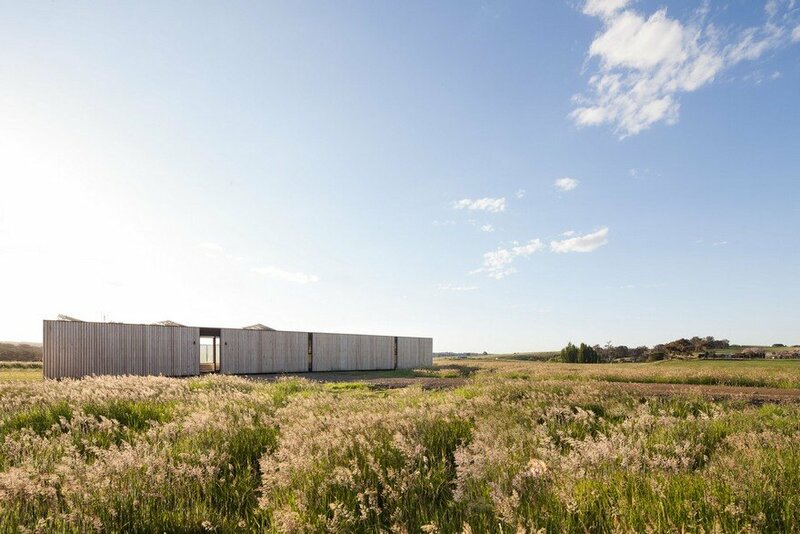 Sitting peacefully in an open field, this off-the-grid sustainable house captures the views without compromising on environmental performance. 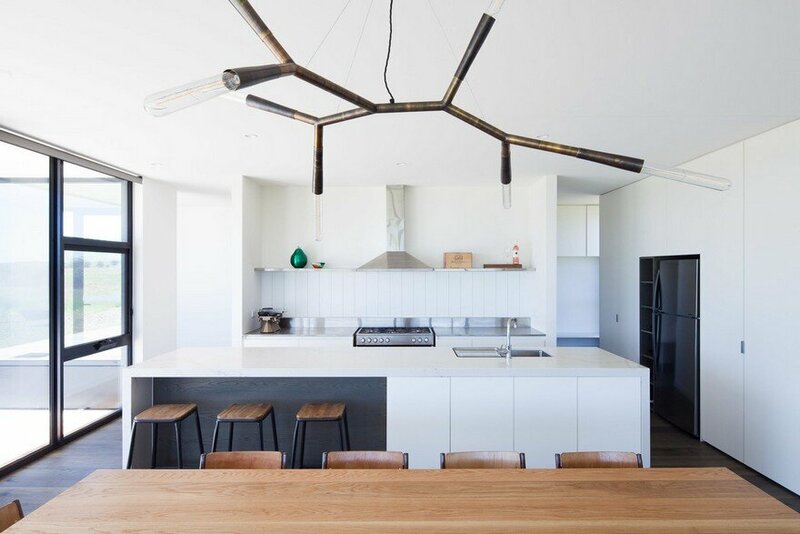 Located at Franklinford in Victoria’s Central Highlands, the four-bedroom home is shared between two families, providing a gathering place for the extended family and a place to relax and relish the joys of rural life. 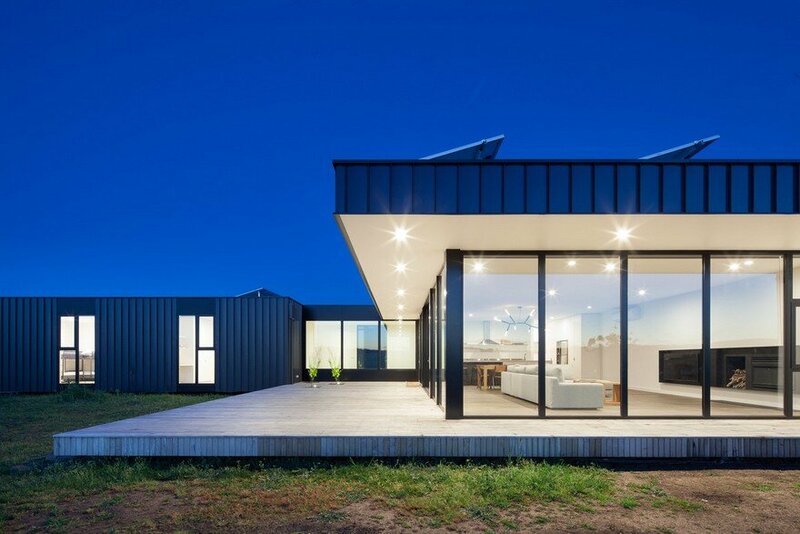 Taking its cues from agricultural buildings in the surrounding farmland, this modular home is predominantly clad in Colorbond with accents of Vitrabond. 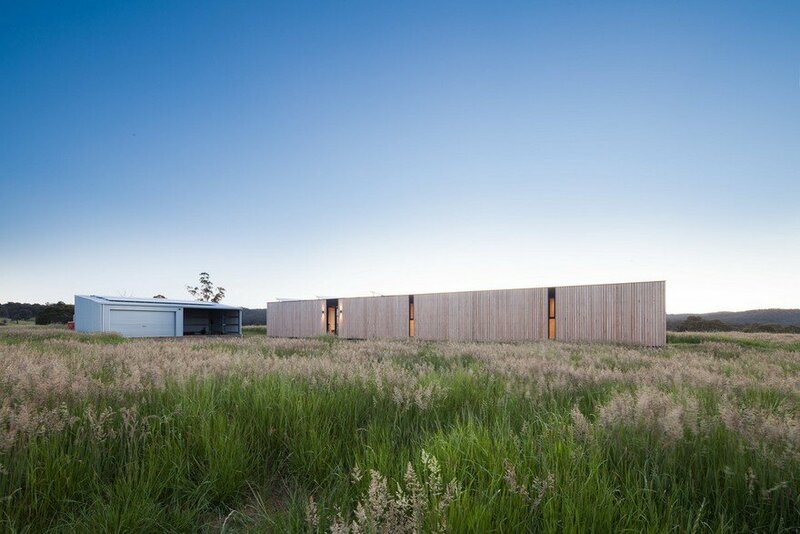 Yet upon approach it’s the radially sawn timber board & batten clad form that commands attention. 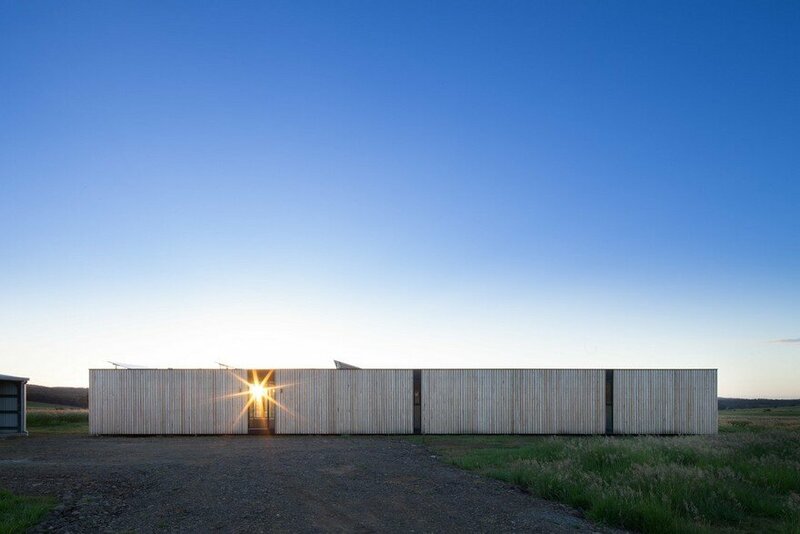 This beautifully textured façade conceals the calm rural retreat, with the long form providing a sense of enclosure and privacy. 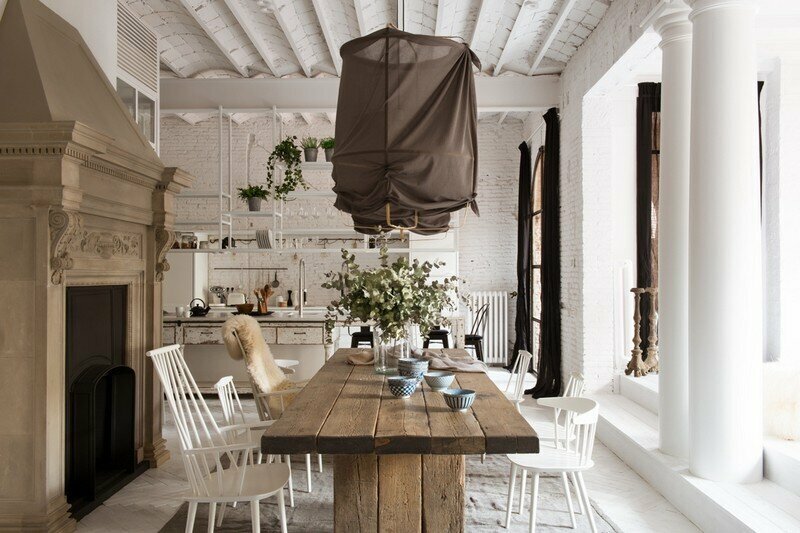 Internally, a light material palette makes for a crisp and spacious home. 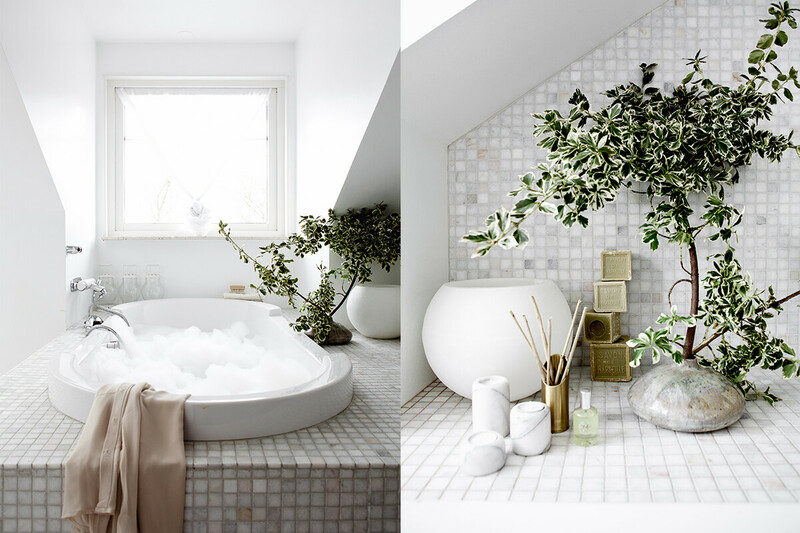 Rooms are washed in white, a marble-effect Caesarstone benchtop is selected, and white laminate joinery is used throughout. 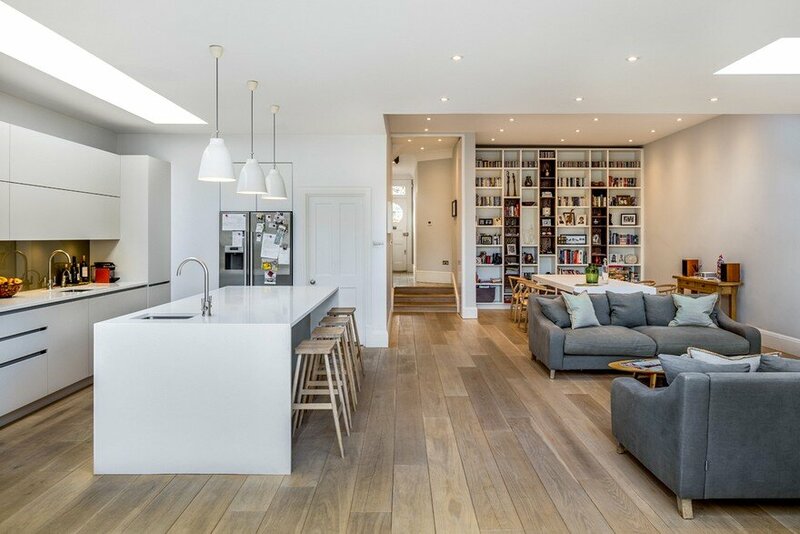 These elements create a beautiful contrast against the dark oak timber floors. 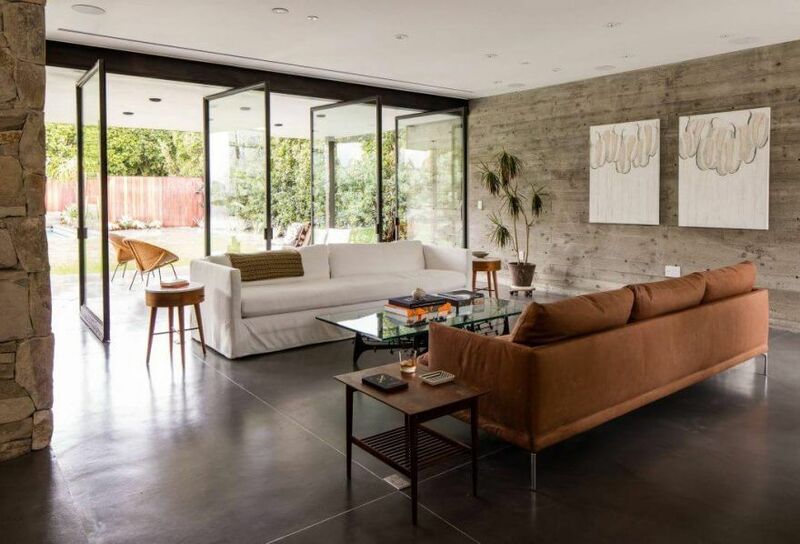 The large living wing, separated from the private bedroom wing, is the focal point of the home. Living and entertaining spills outdoors thanks to expansive floor-to-ceiling glazing opening up to a north-facing, sun-drenched deck. 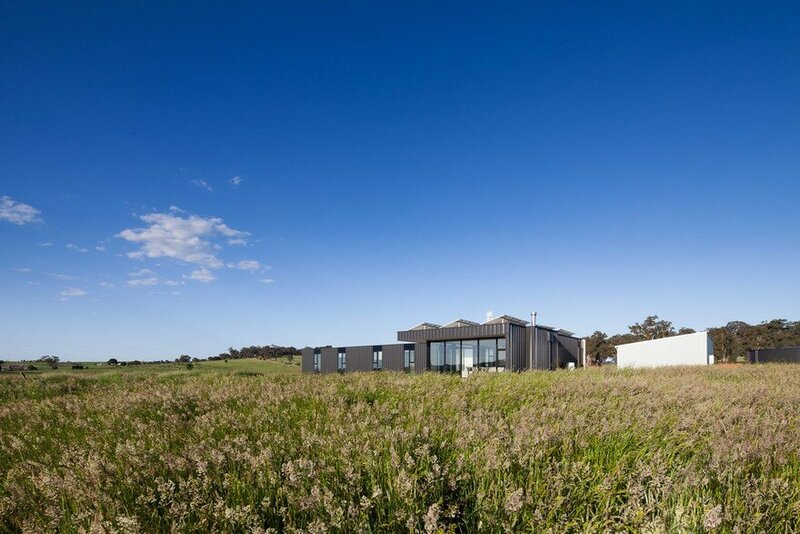 Views of the surrounding paddocks and creek are captured the moment you walk in the front door. 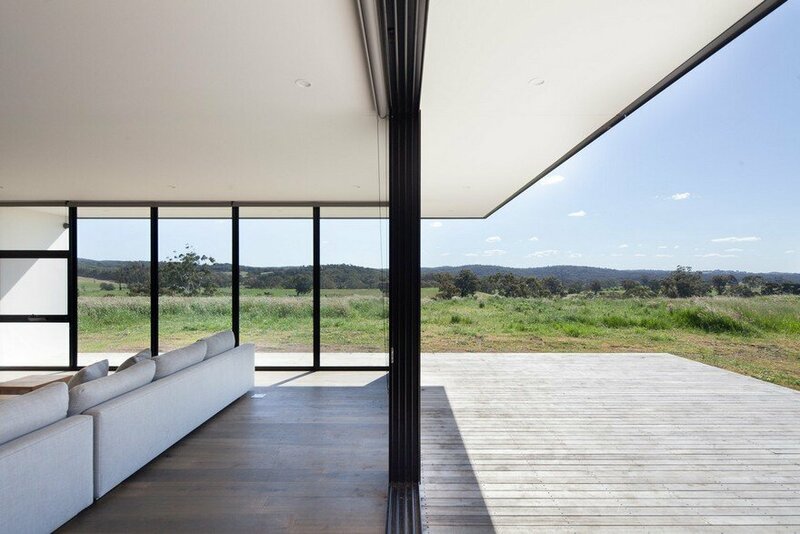 The window itself becomes an ideal space to put your feet up and relax. Being a rural property, a mudroom laundry with external access was a must –a seat was even included in the joinery brief so that you can take off your dirty boots before heading indoors. 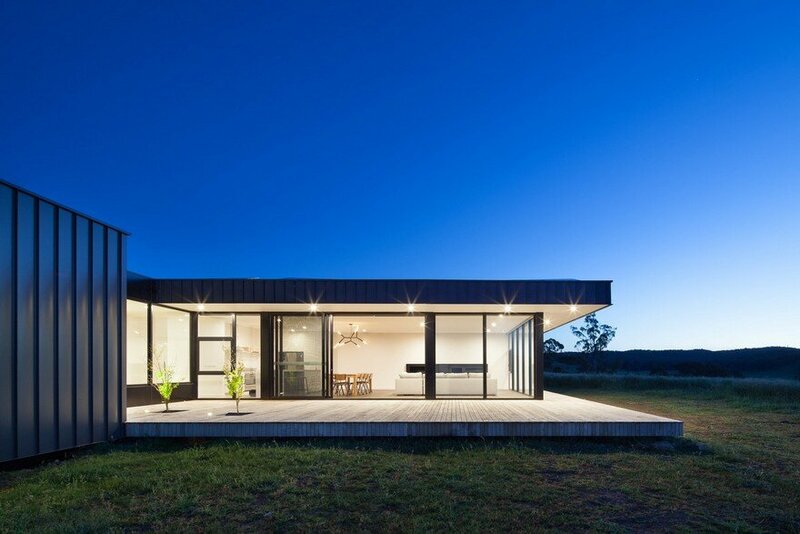 The house is completely off-grid with all services systems designed to not compromise on the clients’ lifestyle. A nearby shed hosts the solar panel and storage system and a large 80,000L water tank is in use. Like all Modscape modular homes, Structural Insulated Panels (SIPs) have been incorporated to create a highly-insulated shell. 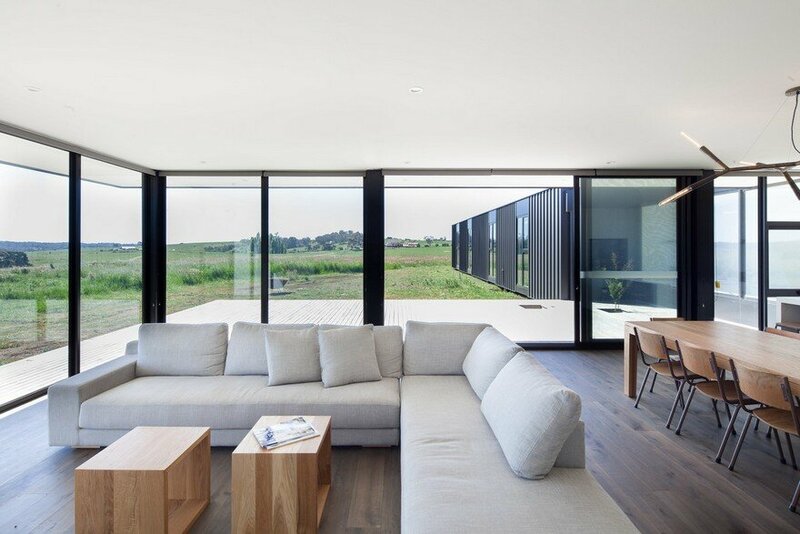 The house has been oriented to capture the sunlight in winter, particularly in the large living area where the families spend the majority of their time. 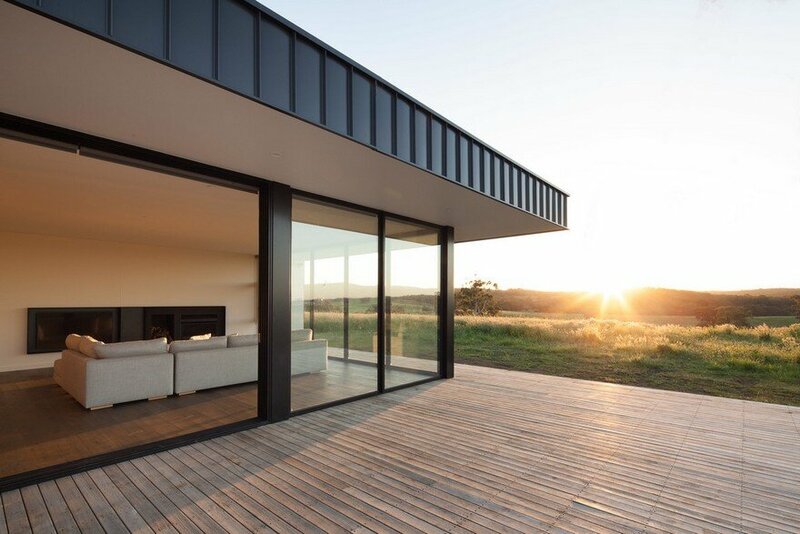 Carefully considered eaves together with thermally broken, low-e double-glazed windows which minimises solar heat gain in summer.